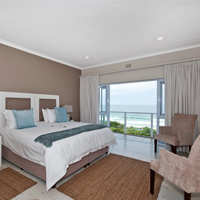 The Robberg Beach Lodge offers beautifully decorated beachfront accommodation. Each spacious, comfortable room offers a five star experience that you will not forget. 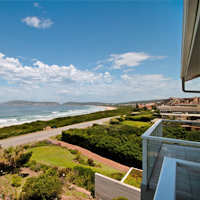 The Robberg Beach Lodge promises the best available rate - guaranteed! If you've found cheaper rates elsewhere, let us know and book directly with us at the lodge for the same rate. Browse through our gallery and explore our facilities, weddings on the Robberg beach, see the magnificent views our rooms offer, and all there is to do at the lodge. 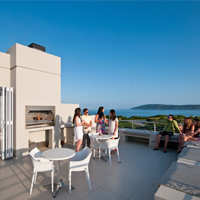 The Robberg Beach Lodge offers beach-front accommodation in Plettenberg Bay. For the best beach-front accommodation in Plettenberg Bay, The Robberg Beach Lodge offers what your heart desires, to make yours a dream holiday. Nestled at the heart of the world-famous Garden Route, Plettenberg Bay is a destination of distinction for all travellers in South Africa. Its splendid sky and seascapes and the unspoilt beauty of its lagoons and beaches, as well as a great selection of restaurants, bars and coffee shops, make it a great destination for all ages. There are so many things to do in the area, especially for families and couples on a romantic retreat. Just five minutes from the bustling restaurants, galleries, coffee shops and bars of Plett’s Main Street, The Robberg is a tranquil beach-side haven. This understated, private retreat boasts 5-star luxury accommodation, and is ideally situated, at Robberg’s beautiful Blue Flag Beach. Fly into the coastal town of Plettenberg Bay direct to the local airport, less than a ten minute drive from The Robberg. Find yourself in the popular town buzzing with excitement during the festive season. Where to stay in Plettenberg Bay? The Robberg Beach Lodge offers luxury accommodation right on the beach at the best rates in Plettenberg Bay. Facilities include two outdoor pools, two lounges, two honesty bars, a rooftop viewing deck, 24-hr reception and check-in. All rooms have private en-suite bathrooms, and daily housekeeping service is included in the rates. Find out more about our accommodation specials and packages.